I arrived 30 minutes earlier for my appointment since we only had a seminar to attend to that Saturday morning in school. And because I already ate brunch with my classmates, I thought of looking for a dessert place where I can wait and satisfy my sweet cravings at the same time. 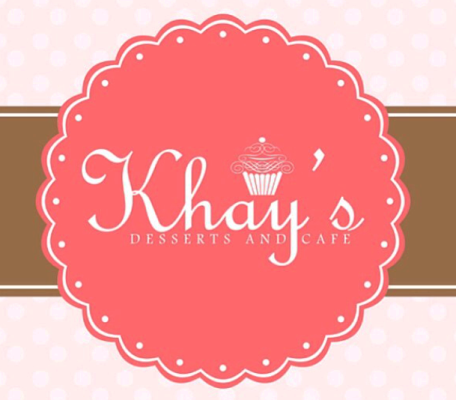 As I was going around the mall, I saw this ridiculously cute place called Khay's Desserts and Cafe. Since I was the only customer that time, I was able to snap photos of Khay's dainty cafe. One will instantly fell in love with the freshly-baked and gorgeous-looking cupcakes neatly stored in the glass cake display cabinet. Did I mention that the entire cafe smells so good too? What a brilliant Valentine's Day gift idea! A bouquet of cake pops that will surely put a smile on your lovey's face! I asked the staff at the counter which of the cupcakes is their bestseller and she recommended for me to try either Salty Albert (Chocolate Cake frosted with Dark Chocolate Ganache topped with Rock Salt) or Little Red Riding Hood (Red Velvet Cake with Cream Cheese frosting). I decided to go for the Red Velvet Cupcake since it had been too long since I ate one. I had high expectations with all the build up from the friendly staff but after one tiny bite (it was too pretty to eat), I knew my choice was wrong because it was too sweet! I like my frosting more on the cheesy side than all sweetness that its like eating sugar bite after bite. Is it just me or everything tastes better with dainty cups and mason jars? Just for the pretty chairs and friendly staff, I will be back to give Khay's another try. And this time, for the ultimate bonding experience with my girl friends -- Afternoon Tea with all the works! Hello! I came over your post when I was searching about Khay's. I agree with you with the red velvet. I had the chance to try them before here at SM Dasma branch and it was too sweet; exactly how you described it. You can read my blog post about them here.